Bamboo is acclaimed to being fast growing and strong. As a renewable resource it is an eco- inexpensive way to furnish your home. Here are some inexpensive bamboo gifts priced at under $25 which I would like to share with you. In Amazon’s Arts, Crafts & Sewing Department, you will find knitting needle sets, circular knitting needles and crochet hooks. Go to Amazon’s Home & Kitchen Department and you will find cutting boards, salt boxes, steamer sets, draw organizers and bowls. Check out Mobile/Cell phone accessories and you will find Amazon advertise iPhone 4 Bamboo Cases and Stands as well as BoxWave Bamboo Stands. “The Snugg” sell hard bamboo cases for Apple iPhone 4s. 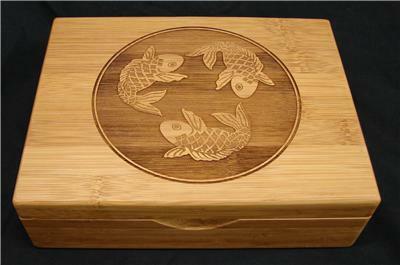 This design of Swimming Koi Fish is etched directly into the Bamboo. The box has 6 separate slots for tea bags, loose tea or jewelry items. eBay Store: Laser Central is happy to do custom work for you if you have a different design in mind. If you have any questions about my suggestions, please do not hesitate to send me an e-mail. I’d be only too happy to help you. Would you like to know more about the benefits of bamboo? Then feel free to read my review on the “Benefits of Owning Bamboo Furniture“. As a giver you should feel good when you do something good for someone else. As a recipient you should feel good when someone does something good for you. Why is it when someone receives a gift they will automatically think of how much it cost the other person? Their first response is, “You shouldn’t have”. Then their second thought would be, “Now I’ve got to buy them something”. The giver too thinks, “Well, I hope they appreciate this because I’ve spent a lot of money on the present”. My mother always told me that it matters not the dollar amount which is spent; it is the thought that counts. The value is in the friendship made and the love for family. Giving is showing you care without expecting something in return. The spirit of giving comes from the heart and has a ripple effect. It’s infectious. The receiver now has an attitude of gratitude and passes this along. Without realizing, the giver and receiver are both attracting abundance in their lives. I feel sorry for people who refrain from giving or accepting gifts. Their ‘Ebenezer Scrooge’ ways are not only hurtful to them but to others around them. They are preventing themselves from experiencing joy and miss out on so much that life can give them.